An original letter of correspondence between Sydney Octavius Chase and E. Magnuson. 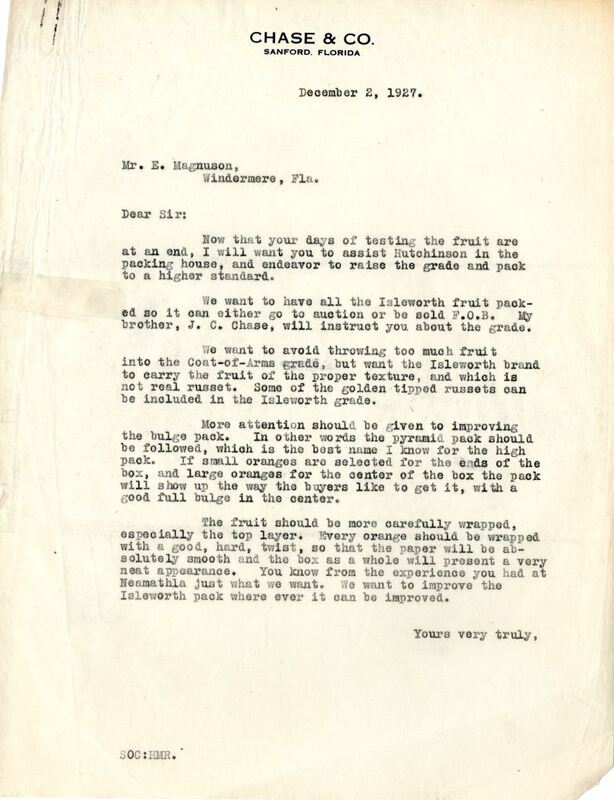 Topics discussed in the letter include Chase's instructions for Magnuson to assist C. Hutchinson in the packinghouse at Isleworth Grove and how to grade and pack the fruit at a higher standard. Original letter from Sydney Octavius Chase to E. Magnuson, December 2, 1927: box 49, folder 20.84, Chase Collection (MS 14), Special and Area Studies Collections, George A. Smathers Libraries, University of Florida, Gainesville, Florida. Digital reproduction of original letter from Sydney Octavius Chase to E. Magnuson, December 2, 1927. Now that your days of testing the fruit are at an end, I will want you to assist Hutchinson in the packing house, and endeavor to raise the grade and pack to a higher standard. We want to have all the Isleworth fruit packed so it can go to auction or be sold F.O.B. My brother, J. C. Chase, will instruct you about the grade. We want to avoid throwing too much fruit into the Coat-of-Arms grade, but want the Isleworth brand to carry the fruit of the proper texture, and which is not real russet. Some of the golden tipped russets can be included in the Isleworth grade. More attention should be given to improving the bulge pack. In other words the pyramid pack should be followed, which is the nest name I know for the high pack. If small oranges are selected for the ends of the box, and large oranges for the center of the box the pack will show up the way the buyers like to get it, with a good full bugle in the center. The fruit should be more carefully wrapped, especially the top layer. Every orange should be wrapped with a good, hard twist, so that the paper will be absolutely smooth and the box as a whole will present a very neat appearance. You know from the experience you had at Neamathla just what we want. We want to improve the Isleworth pack where ever it can be improved. Chase, Sydney Octavius. 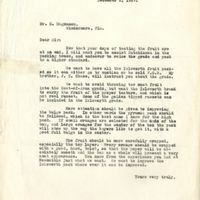 “Letter from Sydney Octavius Chase to E. Magnuson (December 2, 1927).” RICHES of Central Florida accessed April 23, 2019, https://richesmi.cah.ucf.edu/omeka/items/show/2751.